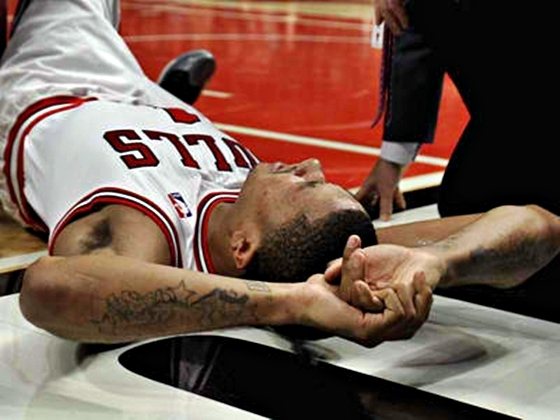 Chicago Bulls Star Player, Derrick Rose, tears ACL during a game against Philadelphia 76ers. Chicago Bulls Derrick Rose is out for the rest of the NBA playoffs. The star player suffered from a torn ACL during a game against the Philadelphia 76ers, earlier today. Rose was injured while trying to leap using his left foot, at the last minute of the game. He was taken to the hospital after the team medical personnel came to his rescue and tended him the locker room. Rose had 23 points, nine rebounds and nine assists when his misfortune occured. The Bulls won the game, with a score of 103-91. “It’s like the saddest win. Regardless, we’ve got to pick ourselves up. We’ve played a lot of games this year without him. So maybe it was just getting us ready for this.” says teammate Kyle Korver , when asked about the team’s fate, now that Rose won’t be able to play.